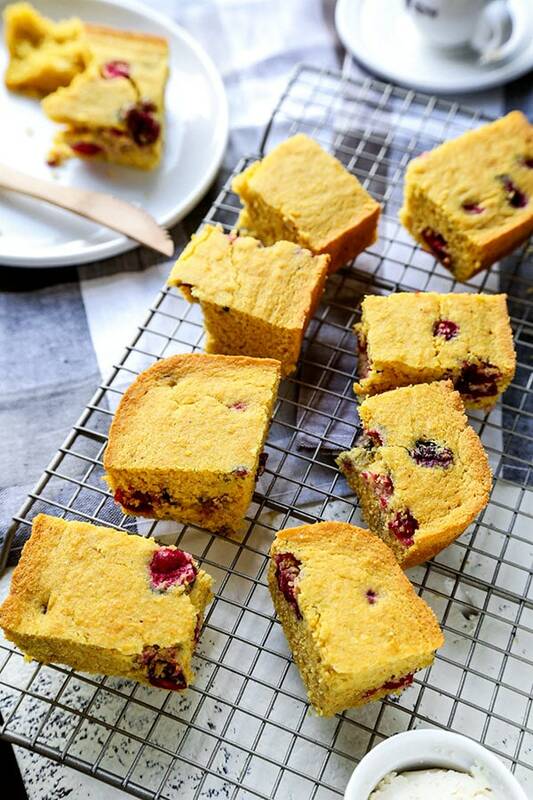 This fruit studded Gluten Free Cornbread With Cranberries Recipe is soft, subtly sweet and 100% delicious. Everyone at the table will be asking for seconds! 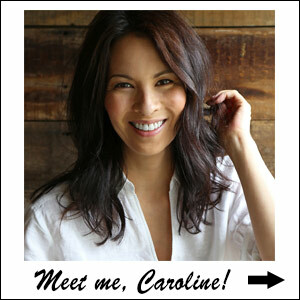 When I send out my holiday meal invites, I get into it! I want to know everything. Can you make it to dinner? Who would you like to bring? 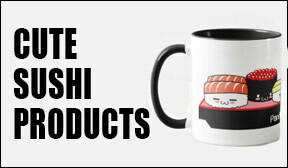 What’s your favorite drink? And, most importantly, are there any dietary restrictions I should be aware of before hitting the grocery store? In years past, the one reply I would get that would put me on high-alert was that an attending guest followed a gluten free diet. You see, I’ve had lots of experience with vegetarian and vegan recipes. However, omitting wheat to keep things gluten free is a lot more than just not using wheat. It’s also avoiding sauces and mixes that contain wheat. AND being super mindful of possible cross contamination. Well, thankfully I’m a lot more familiar with preparing gluten free recipes now! I think you’ll agree with me that making sure everyone that comes for Thanksgiving dinner at your place is satisfied at the end of the meal – regardless of dietary restrictions – is job numero uno! 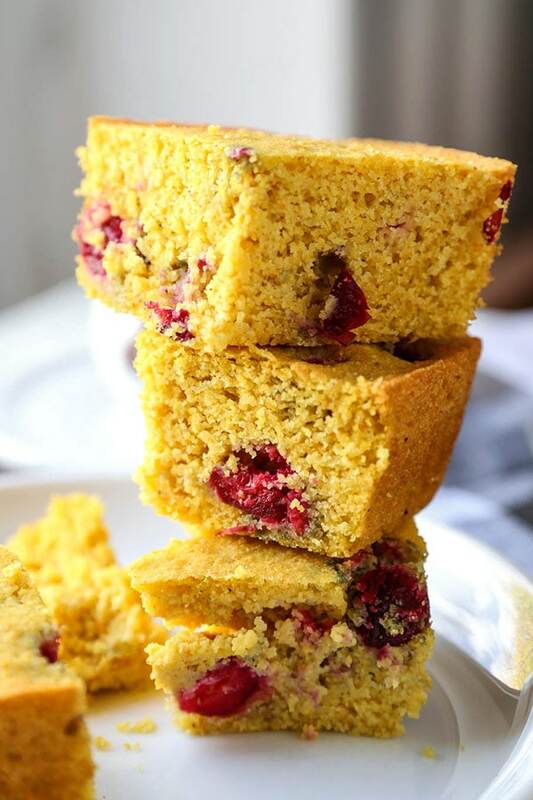 Thankfully, this fruit studded homemade cornbread recipe is slightly sweet, obscenely delicious and totally gluten free. It’s fair to say that I’m a big fan of cornbread. And it doesn’t have to be a holiday meal like Thanksgiving or Christmas for me to whip up a moist and easy cornbread recipe. Any day will do! However, the holiday season does seem like the perfect time to have the whole house smelling like baked goods. Pulling a tray of cupcakes or a healthy cornbread muffin recipe out of the oven on a cold, snowy day just has a cozy, cinematic feel to it. It’s prime winter! Making this easy gluten free cornbread at home is a cinch. 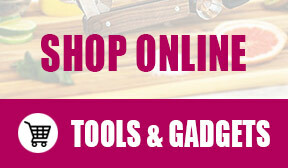 And don’t worry if you get more nervous about baking than with other cooking projects in the kitchen! I’m right there with you 🙂 Baking is more science than feel. But, hey… if I can do it, you most certainly can! 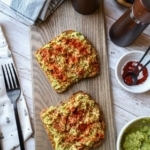 Now, simply whisk a cup-and-a-half of gluten free cornmeal with a half-cup of gluten free all purpose flour, a teaspoon each of baking soda and kosher salt – and two teaspoons of baking powder. Then, in a separate bowl, mix your wet ingredients together. Whisk an egg with four tablespoons of extra virgin olive oil, a cup-and-a-half of low-fat buttermilk and a quarter cup of maple syrup. At this point, it’s time to mix our wet and dry ingredient mixtures together. In a large bowl, stir both mixtures until they are well blended. Then add a cup of fresh cranberries (thawed frozen cranberries work well too) to the mixture and gently fold into the batter. Just line a 13″ x 9″ baking dish with parchment paper (or use cooking spray), and pour the mixture in. Bake for about 25-30 minutes at 375°F. You’ll know it’s ready when the edges are slightly browned. Furthermore, you can test doneness with a toothpick. If you insert a toothpick in the center of your cornbread – and it comes out clean – it’s cooked through. Told you that was easy! How does this gluten free cornbread taste? 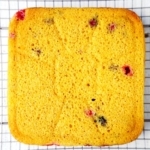 The difference – from a flavor perspective – between most easy cornbread recipes and this cranberry dotted gluten free cornbread is the balance of tart and sweet. Now, as I mentioned, I used maple syrup as a sweetener instead of sugar. 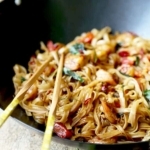 It adds a subtle sweetness to the mix without being cloying or overpowering. 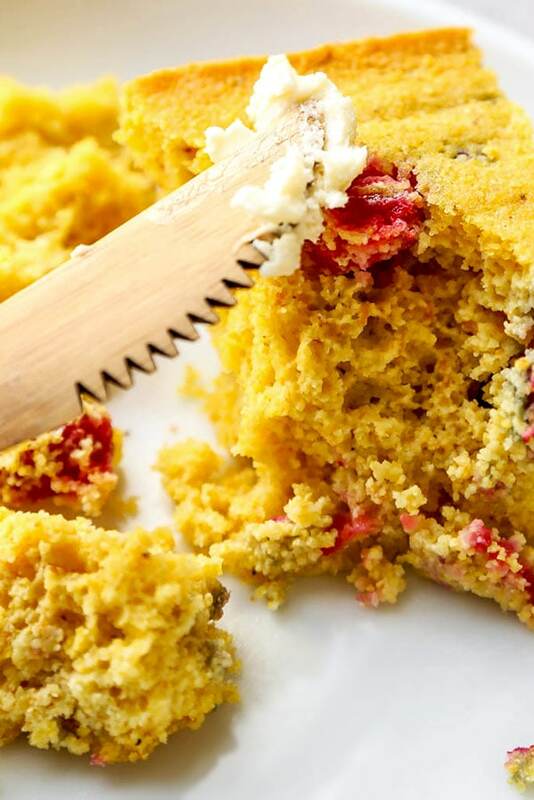 You could totally eat this gluten free cornbread with savory elements of your dinner. And this moist cornbread is pillowy in the center with a perfect crumble around the edges. Baked-in fresh cranberries deliver a zing that is out of this world! The interplay between exquisitely sour and understated sweetness is a one-two punch of flavor perfection. I made a batch last weekend and spread the fresh-baked goodness around the building. Between velvety bites, my neighbors said it was the best cornbread recipe they had ever tasted. Yep – it’s fair to say their praise had me blushing! 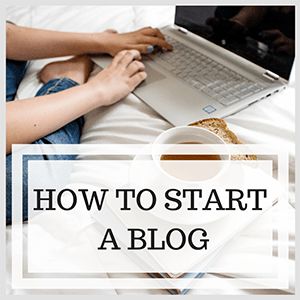 This sounds simple – but has pitfalls to watch out for. Cornmeal, in it’s purest form, is gluten free. So, you should be able to just NOT use wheat flour and be good, right? Wait, seriously… Is cornmeal gluten free? Many of the manufacturers that produce cornmeal also process wheat on the same machinery. So it’s important to buy cornmeal that was produced in a gluten free facility to avoid cross contamination if you want to make a truly gluten free cornbread. 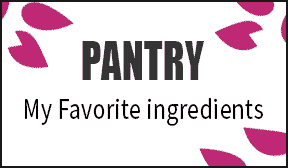 Also, many cornbread recipes and pre-made mixes contain wheat flour. Therefore, make your cornbread from scratch – with a truly gluten free cornmeal and gluten free all purpose flour – and ALL of your guests will be happy with this delicious recipe regardless of dietary restrictions! 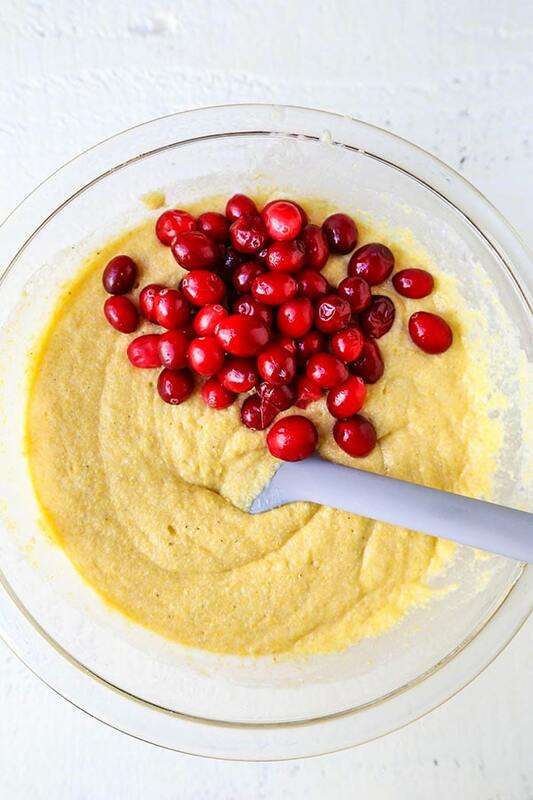 Now, most of the ingredients you’ll need to make this cranberry laced holiday cornbread recipe are likely readily available at your corner grocery store. However, if you’re like me, you probably like to know what to be on the lookout for. And it’s also nice to do a little price comparison! 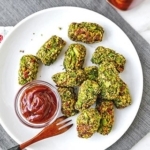 Again, unfortunately it’s not enough to rely on cornmeal just naturally being gluten free – or picking up any old gluten free all-purpose flour. 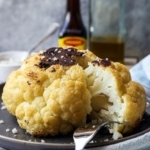 When cooking for those with celiac disease, it’s imperative to buy items that were manufactured in gluten free facilities to avoid cross contamination. This year, aside from my vegan stuffing and slow cooker green bean casserole, there will be some gluten free options as well. 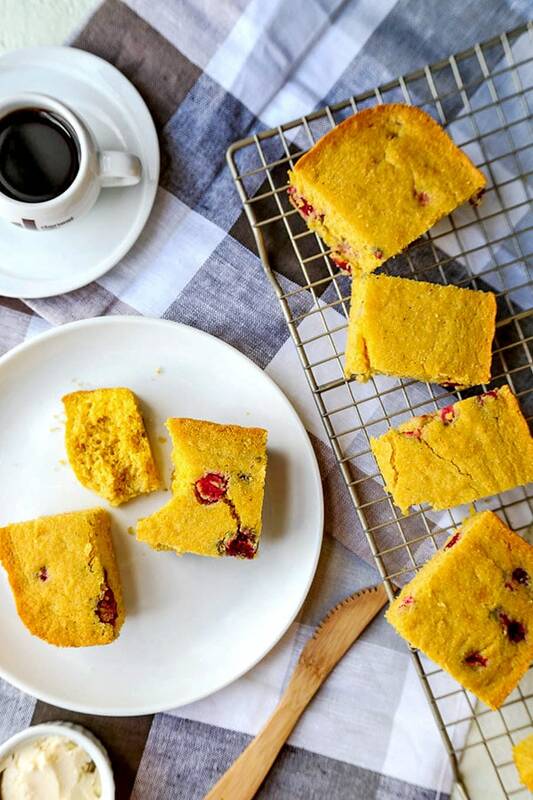 This slightly sweet, sour and super moist gluten free cornbread recipe will hit the spot for everyone – regardless of dietary restrictions! What about you? Is there a holiday side dish that you make at your place that is a big hit every year? I’d love to hear about it in the comments section below! 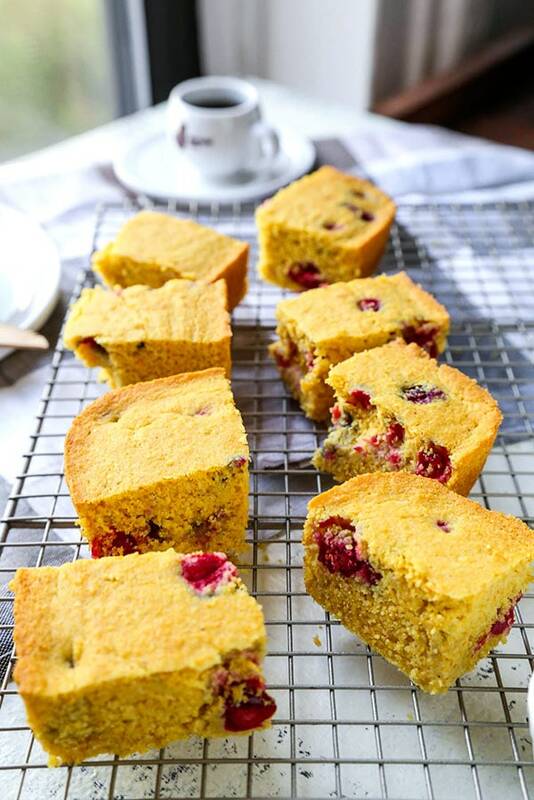 Did you like this Gluten Free Cranberry Cornbread Recipe? Are there changes you made that you would like to share? Share your tips and recommendations in the comments section below! 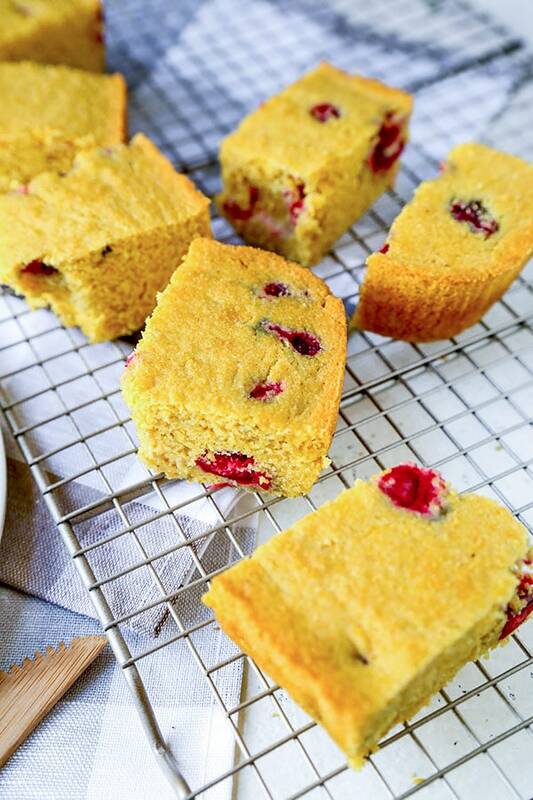 A sweet gluten-free cornbread with tart cranberries recipe everyone will love! Line a 13×9” baking dish with parchment paper or nonstick spray. 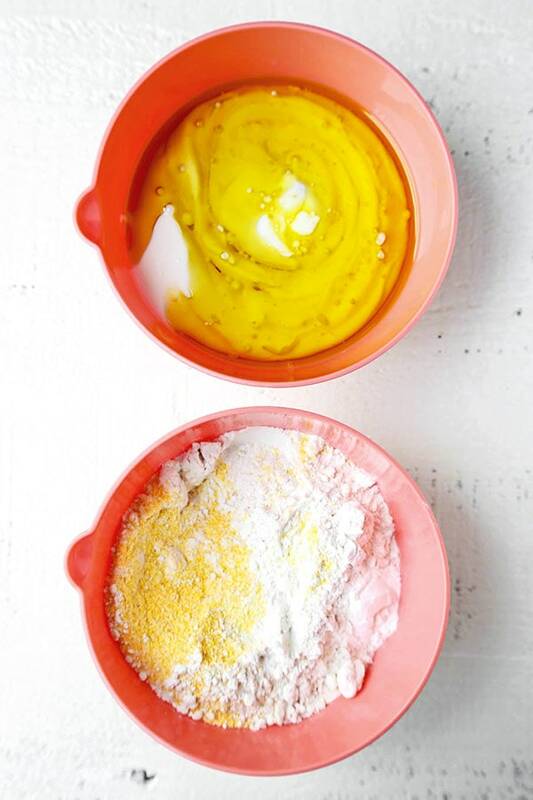 In a large bowl, whisk cornmeal, all purpose flour, salt, baking powder and baking soda. In another bowl, whisk egg, olive oil, buttermilk and maple syrup. Add wet ingredients to the dry ingredients and stir until well blended. Add cranberries and gently fold into the mixture. Pour the mixture into the baking dish and bake for 25-30 minutes, or until brown around the edges. Test the center with a toothpick; the cornbread is ready when the toothpick comes out clean. 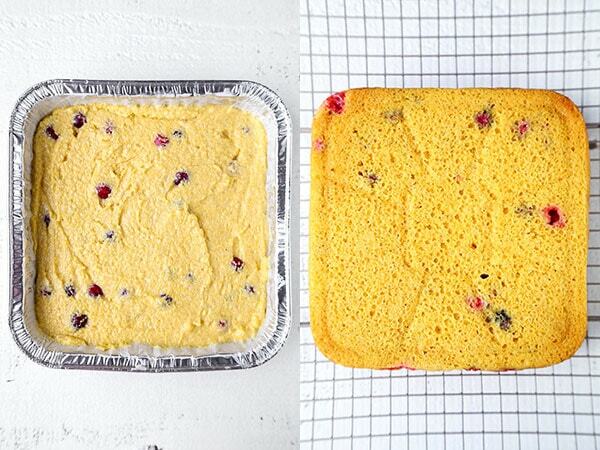 This gluten-free cornbread with cranberries will keep stored in an air tight container for up to 5 days, refrigerated.